What Causes Eyebrow Hair Loss? How Do You Treat it? What Causes Eyebrow Hair Loss? And How Do You Treat it? Eyebrow hair loss can be a real concern if it becomes severe and permanent because, without them, the face can look very odd indeed. The most severe it can get is through the autoimmune diseases alopecia totalis and alopecia universalis (both of which are extreme versions of the related condition alopecia areata). But, as you'll see below, thyroid conditions can also adversely affect eyebrow hair growth. As the names suggest, totalis and universalis can cause total eyebrow alopecia - i.e., complete loss of all eyebrow hair. And given that these two conditions can be permanent, anyone affected by them might just have to learn to live without their eyebrows, or deal with it in some other way. First of all, a hair transplant won't help. That’s because, in these autoimmune diseases, the body attacks its own hair follicles. This means that any remaining hair you might* have somewhere on the rest of your body can't be transplanted because it would still be attacked by the immune system. * Chances are you wouldn't have any available donor hair that’s suitable anyway. Also, eyebrow hair is different from hair elsewhere on the body. Eyebrow growth produces short hairs. That's because, the eyebrow hair growth cycle is much shorter and slower than the scalp hair growth cycle. This means that your scalp hair can grow long but your eyebrows always stay short. There are only a few other types of hair with similar characteristics as your eyebrows (perhaps hair from the back of the neck) and these might be suitable for an eyebrow hair transplant if if weren't for the autoimmune aspect of alopecia totalis and universalis. 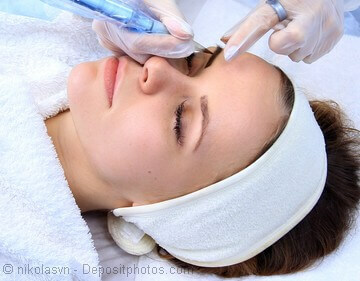 So, getting an eyebrow tattoo, or using an eyebrow pencil, might be the best way to get your eyebrows back. Learn about alopecia areata, totalis and universalis? Less severe forms of eyebrow hair loss can slowly develop from thyroid conditions, particularly hypothyroidism. A common symptom of hypothyroidism is thinning or loss of hair from the outer third of both eyebrows. Women are much more prone to thyroid disorders than men, which means it’s also more likely that women will suffer hair loss from their eyebrows too. 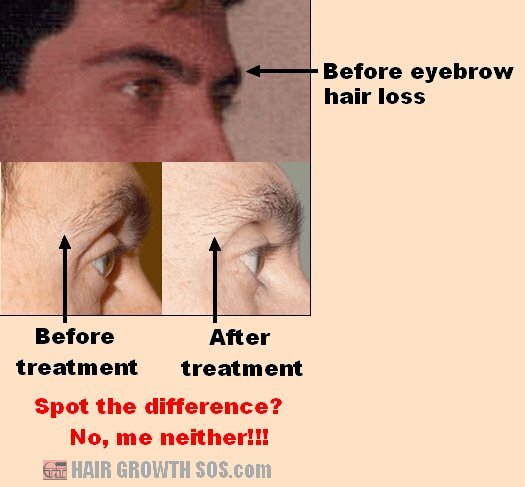 It’s important not to simply try and treat the symptom you can see - i.e., hair loss at the eyebrows. You’ve got to deal with the underlying problem that caused it in the first place. And, in the case of hypothyroidism, there are several possible causes. Learn about hypothyroidism and other thyroid conditions? I’ve suffered eyebrow hair loss myself. For me, it was quite a gradual process, so I didn’t really notice it developing. Then, one day, I just happened to realize that the outer third of my eyebrows had almost completely disappeared, with just a few hairs remaining (see photos below). Although I managed to develop and successfully use my own techniques to remedy my scalp hair loss, my methods won’t help with eyebrow hair loss. So, instead, I decided to try a topically applied copper peptide product called Folligen. From the photos below you can see that this idea didn't work out too well for me! You can learn more by reading my review of copper peptide products. Can You Completely Reverse Eyebrow Hair Loss? If you’re young, there’s a good chance you can get your eyebrows growing properly again. The problem is though, that thyroid conditions are slow to develop, making them difficult to detect. So it’s quite possible that you could develop slow progressive eyebrow hair loss for several years before you finally realize that a thyroid condition is behind it. Hounding your doctor to get it checked out thoroughly is clearly what you’d need to do. And if you don’t even have eyebrow hair loss right now, but are keen to avoid it, getting regular blood tests to check your thyroid hormone levels is a good precaution to take. A nutritional deficiency can often play a role in hair loss conditions too. So, any blood tests you have could also expose a deficiency (such as iron or iodine). In which case, taking a simple dietary supplement might help. But, if you’re quite elderly, your body’s metabolism is likely to be naturally slowing down. So, since hypothyroidism also slows down the metabolism, it might be very difficult to get both your rate of metabolism or eyebrows back. "Just wanna say sir in one month only, my hair have become so much healthy. Thanks to you sir all my friends will also buy your ebook. They are like in love by seeing my hair from thinning to getting healthy just in one month."